Smugglers Cottage has been completely renovated to a very high standard and has two bedrooms sleeping four people. This magical cottage enjoys open plan living and a private garden with stunning views of the River Fowey and the pretty Town. For those colder times of year, curl up on one of the sofas, by the lovely log burner. Free logs are included. Watch the river and relax in the landscaped, sunny garden, with a small ornamental pond, is ideal for al fresco dining or chilling out. The kitchen with it's range style cooker has everything you need from a home from home including a Nespresso machine. The reclaimed pew and chairs in the dining area is the perfect space for enjoying meals. The bedrooms are furnished with lovely bedsteads, luxury matresses and 100% cotton bed linen. Relax at the Juliette Balcony in the Master bedroom and watch the ships go by. Take time out in the beautiful bathroom with bath, feature shower and tumbled glass pebble tiles, there is in addition a conveniently located additional downstairs toilet. Smugglers Cottage is perfect for relaxing and provides an ideal base for exploring this very special part of Cornwall. A short walk to the coast path and Readymoney Cove. Free WIFI and Free Logs. 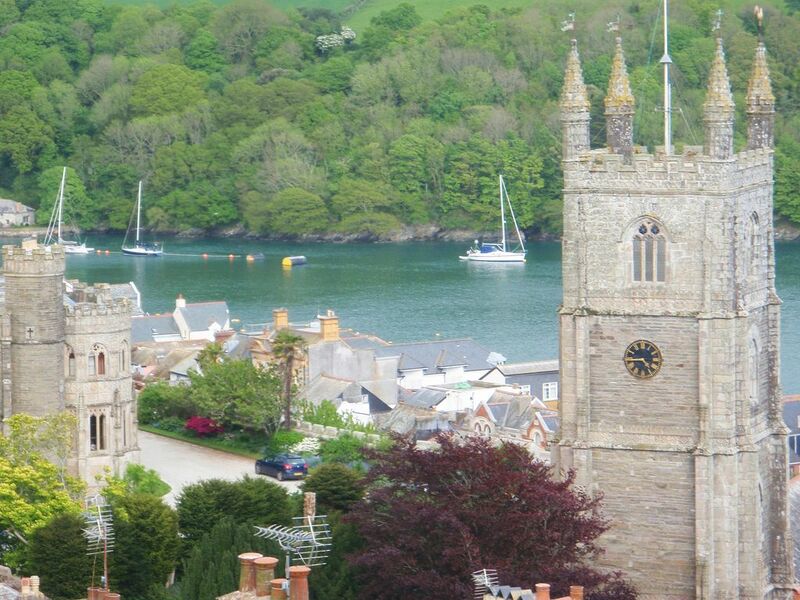 Pete and I moved to Fowey in 2001 after we fell in love with it when we sailed here. We renovated Smugglers Cottage ourselves and wanted to make it a real home from home. We handle the bookings and management of the cleaning and maintenance ourselves with the help of our lovely housekeeper Celene. We both love Fowey and can often be seen out on the water in "Little Gem" our fishing boat. When we first looked at Smugglers Cottage it was in a sorry state and the garden was overgrown, but we fell in love with the views and magical feeling it had. We really enjoyed renovating it and bringing it back to life. Loving how you can just sit on the terrace and watch the boats go by. Or chill by the fire with a glass of wine. The views are really special from the both inside and out. A traditional, cosy cottage atmosphere with all the comforts of modern living. The bathroom has a lovely shower over a generous shower bath, toilet and basin. The shower also has a hand held shower attachment. The bathroom is finished with quality fittings and tumbled glass pebble tiles. Downstairs there is a toilet and washbasin. Available 2 minutes away in main carpark, weekly tickets available in advance which include many long stay carparks in the price (2018 price £47 for the week) or free street side close by. This cosy, traditional living area enjoys two, two seater settees, Smugglers chest coffee table and hearth side rug. It has an Aga wood burning stove. Oak flooring with patio door opening on to large sunny slate patio. Stunning views. Small library of paper backs and hardbacks. Paperbacks can be taken if you haven't finished reading one. Delightful, enclosed designed garden with stunning views to the river. Terrace with table & chairs for four, bench for coffee, breakfast set for two at the bottom. Some herbs in pot. Juliette Balcony in main bedroom with lovely views to the river. Notes on accommodation: There is free WIFI access, freeview TV and a DVD player. Free Logs for the woodburner are included. Saturday changeover. Short breaks Friday to Monday or Monday to Friday are available out of season. Please enquire for details. Cot available on request. Unfortunately, we don't accept pets. Outside: This lovely, sunny garden has a slate terrace with table, chairs, parasol and BBQ. Stunning views to the River across Place and the Church. There is a bench seat further down the garden and a bistro table and chairs at the bottom, where you can enjoy breakfast in the sunshine while you watch the boats go by. All seating areas have magical river views. There is also a small pond which may not be suitable for young children. Cleaning / Towels / Linen / Maid service: Bed linen, bath and hand towels and tea towels and cleaning are included. Pretty cottage beautifully modernised with a very pretty garden with views across the estuary. Very well equipped and comfortable. Smugglers Cottage is a 10 mins walk to the coast path and Readymoney Cove. Other beaches can be walked to in about 25 minutes or there are several within a 30 minute car drive. The North Coast Beaches are approx 40 minutes away by car. Fowey Royal Regatta week is third week in August. During the week you can watch the fireworks and the Red Arrows from the patio, or enjoy the entertainment on the Quay each evening. There is entertainment for children including the crab catching competition and the Giant Pasty! On the river you can see the Falmouth Working boats racing together with the local Troy and Fowey river fleet.